T.G. is a 4 time Regional Emmy Award Winner from the NATAS Ohio Valley Chapter for "Best Weather Anchor (2007 & 2010), "Best Weathercast (2007), and "Best News Anchor" (2007) for his part of the coverage of "The Crash of Comair Flight 5191" at Bluegrass Airport in Lexington. T.G. Shuck is an Anchor at WHAS11 in Louisville, KY, specializing in Meteorology. He joined WHAS11 in August 2016, after a 16-year career in television meteorology just down the road at WKYT-TV in Lexington. Shuck began his on-air stint as weekend meteorologist in 1996, was the morning and Noon meteorologist beginning in 1998 and eventually worked his way up to Chief Meteorologist at WKYT-TV in 2001. He left the business for a few years in early 2012 to spend more time with his family and support his 3 daughter’s acting careers, who are all successful Broadway performers in New York City. Born and raised in Lexington, weather has been a life-long passion for him. T.G.’s interest in weather took on a whole new perspective when the "Super Outbreak" of tornadoes occurred on April 3-4, 1974. “As a frightened 5-year-old child just days short of my 6th birthday, this event fueled my desire to learn more about the atmosphere and how it works”. T.G is a 4 time Regional Emmy Award Winner from the NATAS Ohio Valley Chapter for “Best Weather Anchor" (2007 & 2010), “Best Weathercast" (2007), and “Best News Anchor” (2007) for his part of the coverage of “The Crash of Comair Flight 5191” at Bluegrass Airport in Lexington. He was also named “Best T.V. Weather Anchor” from the Kentucky Associated Press for 5 consecutive years between 2006 and 2010. He holds the prestigious Certified Broadcast Meteorologist (CBM) seal from the American Meteorological Society and was one of the first television meteorologists in Kentucky to earn the seal back in 2005. T.G. also holds the Seal of Approval from the National Weather Association (NWA). “As a native Kentuckian, I have deep roots here in the commonwealth. I am thrilled to be here at WHAS, a station with such a great tradition and reputation. 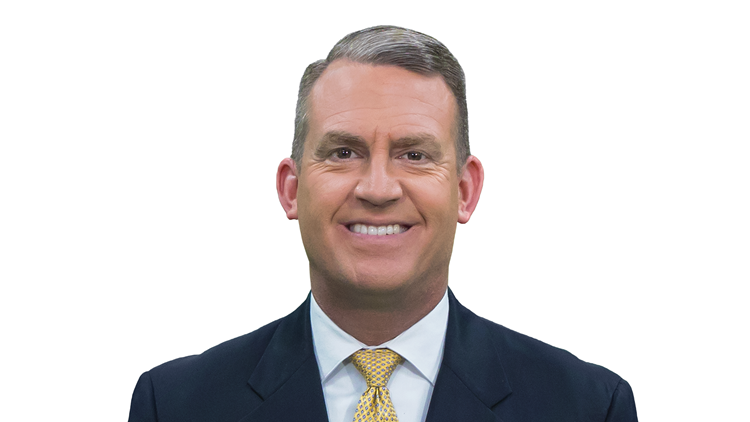 After forecasting and broadcasting in this region for nearly 2 decades, I look forward to serving the viewers of Kentuckiana and providing them with the most accurate, up to date forecast each day.” Shuck said. T.G. loves staying active with all kinds of sports. He enjoys running several times per week and tries to compete in a road race or two each year. T.G.’s favorite sports are college football, basketball, and pro football. He’s a big University of Kentucky fan, but cheers for U of L as long as they aren’t playing “The Big Blue”. His pride and joy are his 3 daughters, Sydney, Brooklyn, and Raleigh. Contact meteorologist T.G. Shuck at tgshuck@whas11.com and follow him on Twitter (@TGweather) and Facebook.